As many of you probably know, my career as a writing teacher and mentor was basically launched when my first writing how-to book Outlining Your Novelbecame a surprise hit. Five years ago, when I published the book, I had absolutely no idea how hungry writers were for help outlining their novels. I wrote the book simply because outlining was something that worked so well for me and was a topic I was passionate about. Even now, Outlining Your Novel remains my most popular book. In it, I explained the basic outlining system I used at the time. I still use that same system, but it’s grown as I’ve grown and been refined as I’ve refined my writing process. Since I’ve (shockingly) never done a complete series on outlining (which I need in order to round out my series on story structure and character arcs), I figured it was long past time to remedy that—and NaNoWriMo is the perfect opportunity to launch a definitive series on my updated outlining process. Over the next few months, I’m going to walk you through the next step up in outlining your novel. 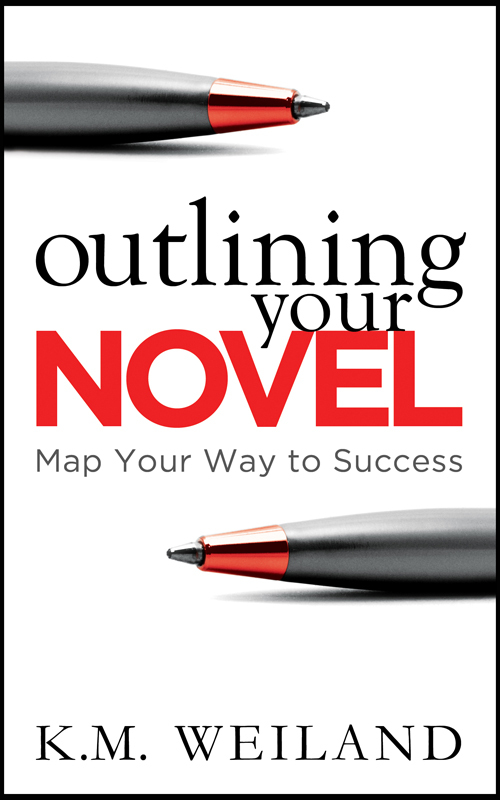 If you haven’t read Outlining Your Novel, I recommend starting there, since it will provide the foundation for the next-gen techniques I’ll be talking about. You can also get an overview of the outlining process I recommend in this post from last year’s NaNo series: 6 Tasks You’ll Love Yourself for Checking Off Your NaNo Pre-Writing List. Before we dive headfirst into the nitty-gritty of how to outline for NaNoWriMo (or any other month), let’s cover some important basics about the what, why, and how of outlining. 1. Does Outlining Mean Listing Scenes? This is probably the most common understanding of an outline. It harks back to those crazy Roman-numeral outlines we were required to complete in high school (and which, if you were anything like me, you probably put together after the fact, once you’d already written your report or book review). An early (failed) Roman-numeraled scene-list outline I started and discarded when discovering my outlining process while writing my medieval epic Behold the Dawn. Scene-list outlines often give writers the willies. Just sitting down and creating a list of events that might happen in your story seems mind-numbing. How can that not inevitably sap all the joy out of actually creatingand discovering the story? If you have to follow that dry old outline while writing the first draft, where’s the fun of storytelling? This understanding, by itself, is single-handedly responsible for scaring many authors away from outlining. 2. 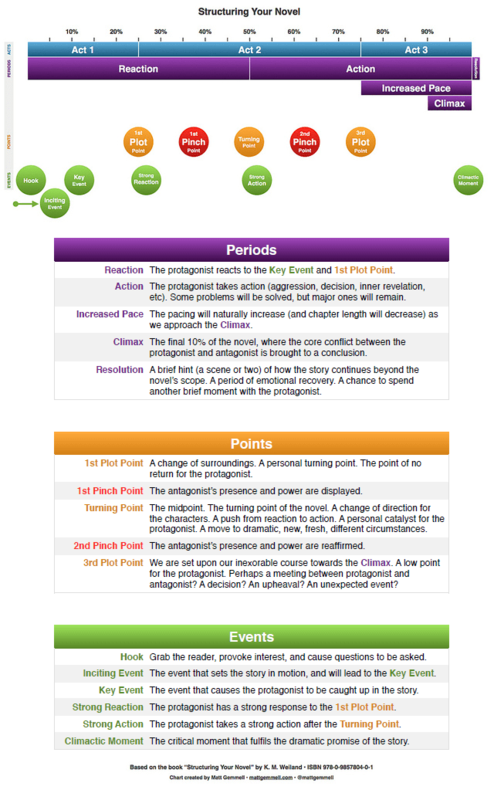 Does Outlining Mean Creating Story Structure? The second most popular—and much more accurate—approach to outlines is the idea of creating a viable story structure for your novel before you actually start the first draft. In essence, this approach actually isn’t that different from the scene list. But instead of randomly listing one scene after another, you’re focusing on the major plot points and other structural moments and making sure they’re all accounted for roundabout their proper timing. This approach is a part of outlining. But by itself, it isn’toutlining. By itself, it also creates far too great a risk of sapping the creativity and spontaneity right out of your process. 3. Does Outlining Mean Brainstorming Your Story? So… if outlining isn’t simply listing scenes or figuring out the story structure ahead of time—what is it? What I then realized was that this reader failed to understand the fundamental nature of a successful and nurturing outline. Outlining is brainstorming, pure and simple. Outlining isn’t a process of sitting down for thirty minutes and coming up with a list of scenes that fits the Three-Act structure. Not at all. Honestly, I shudder at just the thought. No wonder people get scared and bored by outlines if that’s how they’re approaching them! Should you outline your novel? Turns out it’s shockingly fun. What outlining should be is a process of discovery. When you sit down to outline your story, you are entering an exciting zone of creativity, in which you’re embracing and sorting through all your story’s vast possibilities. You’re asking informed questions to help you narrow down your story’s best possibilities, so you can enter your first draft equipped to write it in the best way. Loss of interest in the story. If you’ve experienced any of the above in previous outlining attempts, you can now breathe a sigh of relief. Your outlining is about to get really, really fun. plotters (aka outliners) or pantsers (aka those who write by the seat of their pants). The ongoing feud between these two camps is legendary. Mostly it consists of everyone thinking their way is better and resenting the other camp for doing the same. Epiphany #1: Who cares what people do if it works for them? Certainly, there are great authors in both camps, so there is no concrete proof that one approach is better than the other. Epiphany #2: The whole concept of “plotting vs. pantsing” is a shell game. There’s no such thing. Here’s a guarantee I feel absolutely safe in making: no matter who you are or how you prefer to approach writing, you cannot be exclusively a plotter or a pantser. You’re both. We all are. We all plan some parts of our stories—whether it’s extensively on paper, exclusively in our heads, or retroactively during revision. We all pants some parts of our stories—whether it’s coming up with interesting scenes while brainstorming the outline, diving headfirst into a first draft with no idea where a scene is going, or just piecing together the specifics of generally planned scenes. Please note this declaration isn’t just my well-intentioned attempt to end the war. Rather, this is an important realization for any author: we need both parts of our brains when we write. Creativity and Logic. Pantsing and Plotting. You do not have to fit yourself into one box or the other. You’re free to flow from one box to the next box according to your own preference. You may spend most of your process in the plotting box, or you may spend most of it in the pantsing box. Doesn’t matter. Writing is all about gathering all the tools at your disposal and finding the approach that best optimizes your creativity in that particular moment. In short, even if you prefer to spend very little time in the planning stage before diving into the first draft, you can still benefit from an understanding of plotting and outlining. And that brings us to the first and foremost question facing any author getting ready to write that next book. Should you outline your novel before the first draft? And, if you do, how much is the right amount of outlining for you? I’m prejudiced, of course. I think my approach is the best. The novel is ultimately a complex and logical problem. When you approach it as an equation to be solved creatively within the bumper lane of the outline, you allow yourself enough space to make brilliant mistakes and avoid time-sucking dead ends later on. Getting the story straight before you begin your first draft means you can clear all that space in your brain to then worry about getting your prose right and crafting your narrative to best bring your characters to life. This isn’t to say an outline is the only way to solve the equation of your novel. But outlines make the difficult task of writing a novel much less difficult. If your storytelling instincts aren’t yet honed to perfection, outlines allow you to use all of your brain to create a brilliant architectural blueprint before you order all the supplies and go out there to build an amazing suspension bridge or skyscraper. 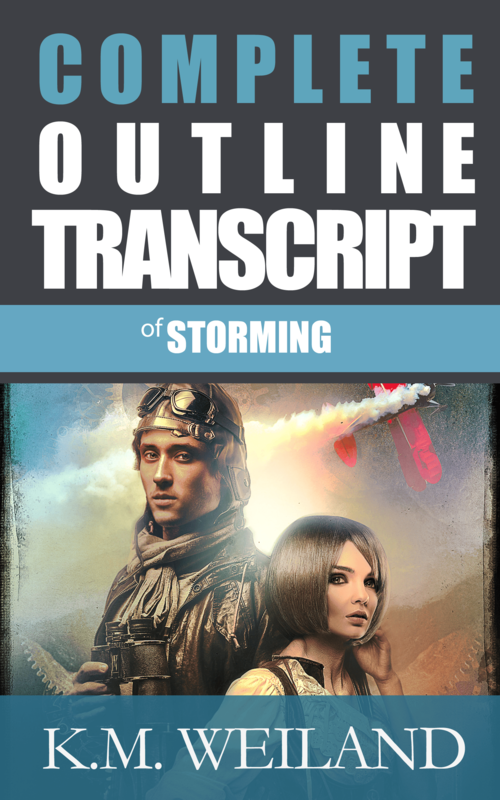 Click the image to download an example of my own completed outline from my aviation-adventure novel Storming. The outlining approach I use and teach is seriously in-depth. My finished outlines can run as much as 50,000 words in their own right and take me several months to complete. Some writers choke on this. But aside from the fact that all the time spent on outlines is just plain fun, I’m also spared the doubt and frustration of first drafts that don’t work. My first drafts flow, and, even better, they usually require very little in the way of major revision.